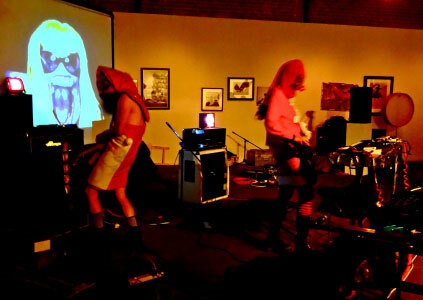 The Santa Ana Noise Fest (SANF4) returns for its fourth installment to the Orange County Center for Contemporary Art at 117 North Sycamore, Santa Ana, CA 92701. Festivities begin at 5:00 PM on Saturday December 8th, 2012. This event is FREE! This celebration of all things experimental, improvised, distorted and loud offers an opportunity for interested parties to test their earplugs with performances from: Brutal Poodle, Cold Grey Eye, Craig Sibley, +DOG+, Endometrium Cuntplow, Grizzly, Jesus Is Dead, phog masheeen, Six Mystic Points, Wire Here, XSXCXEXBX and Yard Goat. A unique feature of the Santa Ana Noise Fest is the “Noise Circle” at the end of the event. This offers an opportunity for all the performers to play together blending their unique approaches to sound production into a swirling vortex of sound. 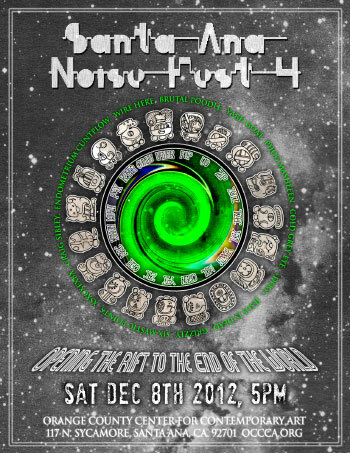 The proximity of the date of the SANF4 to the end of the Mayan Calendar prompted the promoters to suggest that the “Noise Circle” could be used in a ritual manner for “Opening a rift to the end of the world.